I'm Curious Too: Why Don't Penguins Fly? Because it's energetically-inefficient to be both a diver and a flyer at the same time. A recent study on a penguin-like seabird, the thick-billed murre, shows that it's inefficient to be both; be a Jack of all trade and a master of none. Murres are horrible aviators. They beat their wings really fast and they land awkwardly. They fare better in the water, but still not as good as penguins. The study, conducted by Kyle Elliot et al of the University of Manitoba, Canada, shows that when flying, murres burn energy at 31 times their rate at rest. It's the highest energy-spending rate known for bird. Other animals burn energy at 25 times their rate at rest when working the hardest. 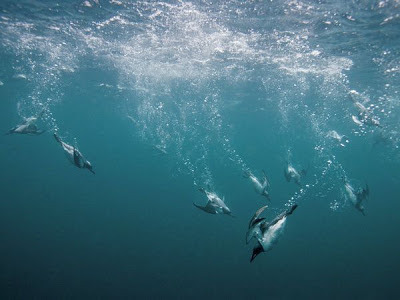 In the water, a murre also burn more energy diving compared to a penguin of the same size. But flying has its own advantages. A murre can escape land predators taking to the sky while penguins, well, can only waddle like a penguin. That's why there are no penguins in the North Pole and no polar bears and arctic foxes in the Antarctic. 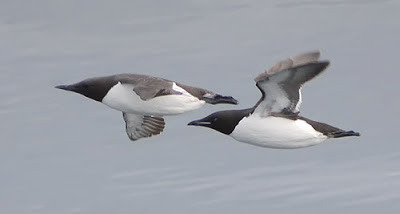 So in a way, a murre is the bridge between the flying and non-flying birds, though they're not especially good at both. Evolution is truly fascinating is it not?